'Seagal' Beach House 3 BR/2 BA, Golf Cart/with WI-FI ..
Our house in Oceanside Village at 211 Sanddollar Drive is located on a private cul-de-sac with little traffic and lots of relaxation. Our house offers 3BR/2BA near ocean, raised beach house in private, gated resort, with WI-FI and new golf cart!! House has 5 beds, sleeps 8 maximum. All rates include linens and towels, cleaned before and after your stay, and use of owners golf cart. All rates are your total out of pocket trate. !..Rates for June-Aug are ranges, call owner for exact rates and discounts. House on 10' stilts, 4 car parking underneath house, ~1000 square foot House is ~420 yards to ocean, short (~5 minute) walk to beach. 5-mile drive to South Myrtle Beach. ~0.5 mile south of Surfside Pier and ~1-mile north of Garden City Beach pier. House is in a nice private gated community with 24-hour security, lots of free resort amenities. This beach house is very nice, fully furnished, redecorated, beachy with full kitchen, new refrigerator, washer and dryer. Resort has community indoor / outdoor pools, new outdoor waterpark, gym (resort charges a fee for gym use), tennis courts, lakes, children's playground, baseball field, basketball court, library, 24 hr. gated security, church, community center. Must be 21 or over, single family or couples, no pets, no smoking and 8 people maximum occupancy. ~$200,000 house value. Magnetic card for ocean side gate available. Golf cart available with house for adult drivers 21 yrs and older only. Bring your laptop, NOOK, tablet as house has WI-FI! !..Ask about our last minute discounts!! Children's water-park play area near the outdoor pool, and new hot tub added 2015! 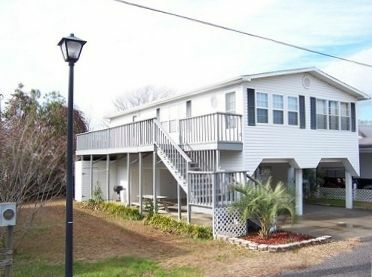 Home is near ocean raised beach house, 3BR/2BA, sleeps 8 and 1000 sf. 1 king bed in master bedroom, 1 queen bed in second bedroom, 1 day bed with trundle bed in 3rd bedroom. 1 sleeper sofa (double bed) in den. Approximately 0.5 mile north of the Surfside Pier. 0.2 acre grass yard. Stick built house on 10' stilts, 4 car parking underneath, very nice, fully furnished with full kitchen, new refrigerator, new AC system, recently redecorated, stacked washer and dryer and many free resort amenities. Large master bedroom with color cable TV and DVD player, king size bed, full bath. Second bedroom has queen bed, tv, and full bath down hall and large closet with stacked washer and dryer in it. Third bedroom has a day bed with trundle and is beside kitchen and dining room. Nice open kitchen with bar stools. House is in private Oceanside Village Resort with community indoor / outdoor pools, water park area, nice gym, tennis courts, fishing lakes, children's and adult playground, basketball court, baseball field, 24 hr. gated security, church, library, community center, mail boxes, etc.. Must be 21 or over to rent from owner, single family or couples, max. 8 people, no pets and no smoking. House has WI-FI internet service!! $200 Refundable security deposit required. Check out is 10:00am, check in is 4pm. 5-10 min. drive to New Market Commons, MB International Airport, Coastal Grand Mall, Broadway at the Beach, The Palace, and public tennis and basketball courts and parks, hundreds of restaurants, Murrell's Inlet seafood restaurants, outlet stores, shops, grocery stores, hundreds of golf courses, theaters, churches, near everything! 15-20 min. drive to N MB's Barefoot Landing, House of Blues, etc. Be sure to check out our other property located 2 blocks away. VRBO # 325364 2 bedroom, oceanview condo, sleeps 6. Karen Reed-owner I love living at the beach. The resort is in a quiet area, and is located between Myrtle Beach and Murrells Inlet. I love being in a golf cart community. Is less crowded that Myrtle beach, but is only a 5 min drive to Myrtle Beach, is really the best of all worlds...close to Murrells Inlet--best seafood restaurants! Love the amenities of indoor/outdoor pool, large playground area, and tennis courts, and is close to the beach! I love riding the golf cart around at night, and going over to look at the moon reflecting on the ocean. I love drinking a cup of coffee while watching the sun rise over the ocean! Oceanside Village is a private, gated, family-focused community which offers other amenities such as volley ball courts, fitness center, baseball field, fishing, lakes and more. Driving golf cart to the beach and to the Conch cafe for Oceanfront Dining--(best shrimp po boy ever! !..walking or riding golf cart to private beach access. Newly installed shower/restroom area in oceanfront/beach parking lot area is great for rinsing sand off. Side yard at the house provides an area to play games, quiet cul de sac is great place to ride bikes. Enjoy relaxing in the rocking chairs while watching the children play. Comfortable king size bed is great after a hard day of relaxing on the beach. Secure internet is nice to check email, catch up on work, or to do banking away from home if needed. Clean linens provided after each stay. House is cleaned before and after your stay. 4 car parking underneath house. 2 door garage for owner's use. Wireless signal can be obtained in house. Please bring your cell phone and wireless laptop computer and air card for internet. House has secure internet! New refrigerator, oven/range, stainless steel sink, microwave, dishwasher, plates, glassware, utensils, cookware, wet bar, etc. Private resort with nice outdoor and indoor heated pools. New waterpark near outdoor pool. Our beach house is golf cart ride, or approximately 5 minute walk to beach, near ocean in private resort-Oceanside Village, Surfside Beach, SC 29575. Very nice home, enjoyed our stay booked for next year. The owner Karen is very nice and very accommodating. We loved the location! The house was just the right size for our group of 4 adults and 4 kids. We were able to get around easily and our host was very nice, helpful, and easy to reach. The furniture needed some updating, especially the chair and sofa bed, the kids ended up in our beds because of the springs. No ac in one of the bedrooms which meant hot nights. I was told the master bedroom was nice and cold. A window unit would be helpful. Also a grill would have been awesome. I’m not a fan of dishes on vacation. There was a charcoal grill near the pools but it was inconvenient, and also very windy and difficult to get started. Overall, we were happy with our stay, but may choose a different location in the future based on our preferences for ac in the bedroom, more comfortable sleeping arrangements for the kids, and wanting a grill. We had thought we saw one in the picture for the listing, but apparently were wrong. For those who need WiFi - it worked great. My husband worked from home on it all week! We are so glad to hear you enjoyed your stay. Yes, a golf cart is great to have in getting to the beach and pools. WIFI is also nice to have to keep in touch with business, emails, and keeping up with news and information. In regard to the AC in the bedroom, we had AIR Doctor Services come out and check our system. Appartently, the family prior to you felt it was too cold in that bedroom and simply closed the vent to that room. It was an easy fix for Air Doctor, and the HVAC system got a clean bill of health. We do not offer a grill at the house due to potential fire hazard. Previously, there was an incident involving a grill, and 4 homes and a boat were caught on fire. There is a nice grilling area at the outdoor pool area for grilling. In addition to the king bed in the master bedroom, there is a queen bed in the 2nd bedroom, day bed with trundle in the 3rd bedroom, sleeper sofa and a futon I. The den. We offer several sleeping options, and can sleep8-10. Yes, we also,over the location of our home. A quiet cul de sac provides room for children to ride their bikes and play with llittle traffic. Everything you would need for a lovely week stay. Very clean home and a plus you don’t have to drag your linens. Karen was very quick with responding and a pleasure to speak with. Would stay here again. Thank you Karen for opening up your lovely home. We are so glad your enjoyed your stay. Yes, we've always felt providing linens is essential. And because linens are needed (like he refrigerator), we do not charge extra for them. For the price, this is a nice place to stay. I enjoyed my stay and the golf cart is a very nice thing to have for a trip to Surfside. Everything worked. The house does have some wear and tear, but I notified the owner to ensure I would not have charged for these things. Good location. Close to beach. House is ~420 yards to ocean, short (~5 min.) walk to beach. 5-mile drive to South Myrtle Beach. ~0.5 mile south of Surfside Pier and ~1-mile north of Garden City Beach pier. House is in a nice private gated community with lots of free resort amenities-see below. This beach house is very nice, fully furnished, redecorated, beachy with full kitchen, new refrigerator, stacked washer and dryer. Resort has community indoor / outdoor pools, gym, tennis courts, lakes, children's playground, baseball field, basketball court, library, 24 hr. gated security, church, community center. Must be 21 or over, single family or couples, no pets, no smoking and 8 people maximum occupancy. ~$200,000 house value. Magnetic card for ocean side gate available. Golf cart available for adult drivers only. House has SECURE internet service!